It's here. The 2018 Silver City Brewery Mariners Pub Crawl. Join us for the quintessential Seattle sports and craft beer event of the summer. 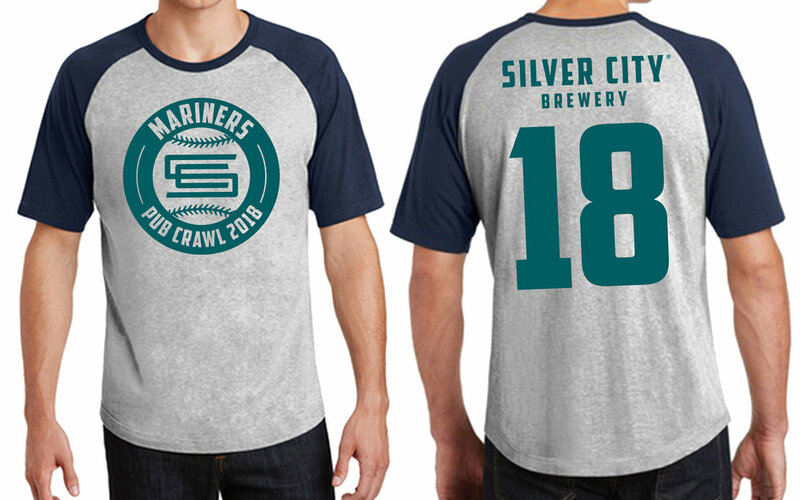 The Silver City Brewery Mariners Pub Crawl, now in its 7th year, brings together hundreds of local craft beer fans in Pioneer Square, with over 10 destination bars & restaurants, culminating in one unforgettable night at the ballpark. Participants will check-in at a specified location at 4:30pm and will receive their game ticket and an exclusive Pub Crawl t-shirt, along with a passport detailing all of the destination pubs. Then, attendees take Pioneer Square by storm, visiting as many destinations as [safely & responsibly] possible. The brewery will be designated a block of seats within Safeco Field so all attendees can represent at the game, en force, with room to mingle. Regular check-in will be held at the Flatstick Pub Pioneer Square at 4:30pm on June 30th. Here you will receive your Mariners game ticket & Pub Crawl T-Shirt. If you are able, we highly suggest checking-in early at our TAPROOM in Bremerton. This will allow you to beat the lines and get straight to pub crawlin' come the day of the event. Early TAPROOM check-in IS NOW AVAILABLE. It's here. The 2018 Silver City Brewery Mariners Pub Crawl. Join us for the quintessential Seattle sports and craft beer event of the summer. The Silver City Brewery Mariners Pub Crawl, now in its 7th year, brings together hundreds of local craft beer fans in Pioneer Square, with over 10 destination bars & restaurants, culminating in one unforgettable night at the ballpark. Participants will check-in at a specified location at 4:30pm and will receive their game ticket and an exclusive Pub Crawl t-shirt, along with a passport detailing all of the destination pubs. Then, attendees take Pioneer Square by storm, visiting as many destinations as [safely & responsibly] possible. The brewery will be designated a block of seats within Safeco Field so all attendees can represent at the game, en force, with room to mingle. NOTE: As a brewery, this is consistently one of our favorite events each year. The camaraderie is downright magical when you see hundreds of people coming together over local craft beer, rocking the t-shirt in Pioneer Square. Each year, we have the privilege of making dozens of new friends, and we hope to see YOU there with us!